The Montana Bunkhouse invites you to come visit our 4,000 acres ranch in Paradise Valley. It has been in the family for four generations with the fifth coming up. You can see Square Butte and Round Butte from here. Famous Montana artist, Charlie Russell, featured these two buttes in many of his paintings. Hike to the Sheepherders' Monuments. While tending their flock the herders built monuments of stone on top of the hills. 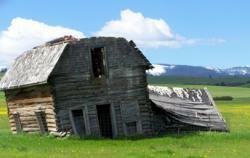 The Montana Bunkhouse formerly housed cowboys who worked on the ranch. It has been remodeled and is now handicapped accessible. It is located at the ranch headquarters. There are two independent rooms each with two beds and a counter for the coffee pot. Dishes, pans, toaster and hot plate provided, so you can cook. Since this is a primitive bunkhouse there is no running water. Potable water is available at the ranch house. There is an outhouse for your use. Nights are always cool. The Paradise Dance Hall was built is 1904 as a community hall on a wooded one acre lot. Later, it was converted to a school house. It is now a spacious two bedroom cabin with each bedroom having a queen and a double bed. There is a fully equipped kitchen, a dining room, and a living room all combined into a great room. The 3/4 bathroom has a washer and dryer. There is a couch and a daybed that will sleep one person each. All you need are groceries. Nights are always cool. Directions: The Montana Bunkhouse and ranch is located at the end of the road 23 miles south of Lewistown, Montana in the Big Snowy Mountains of central Montana. We are 120 miles from Great Falls and 150 miles from Billings.